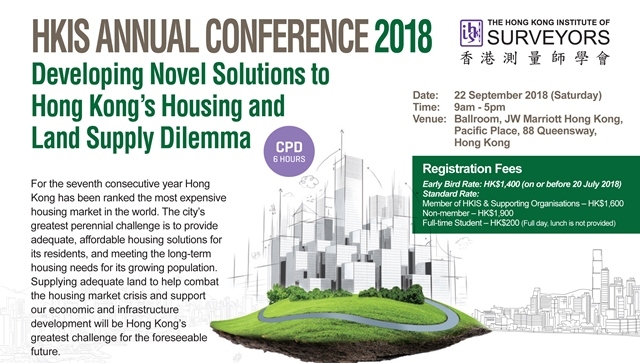 AIA Hong Kong invites you to join the HKIS Annual Conference 2018 – Developing Novel Solutions to Hong Kong’s Housing and Land Supply Dilemma. This event will be held on Saturday, September 22, 2018 commencing at 9:00 am at the JW Marriott Hong Kong. For the seventh consecutive year Hong Kong has been ranked the most expensive housing market in the world. The city is still struggling to provide adequate, affordable housing for its current residents, and to meet the long-term housing needs of its growing population. Supplying adequate housing to support families and ensure our economic and infrastructure development will continue to be Hong Kong’s greatest challenge for the foreseeable future. The HKIS is the largest professional surveying institution in Hong Kong, with more than 10,000 members and a 34 year history. The Annual Conference is a platform for industry stakeholders to share their valuable experience and ideas. With the theme Developing Novel Solutions to Hong Kong’s Housing and Land Supply Dilemma, property industry experts, policymakers and academics will deliver presentations and case studies that analyse Hong Kong’s housing and land supply challenges – and identify opportunities for urban renewal, building rehabilitation and other means of increasing the supply of housing.